David Beckham closed out his Major League Soccer career in triumph as the Los Angeles Galaxy defeated the Houston Dynamo, 3-1, at the Home Depot Center in the 2012 MLS Cup, making defending champion Los Angeles the second club, after DC United, to capture four league titles. Comment: Beckham exited the championship game in stoppage time to chants of “Thank-you, Beck-ham!” by Galaxy fans, a far cry from the first half of his stay. He arrived in 2007 as damaged goods and started just two matches in his first season. The Galaxy lost on a regular basis. He alienated captain Landon Donovan and other teammates. He managed to get himself loaned to AC Milan in a cynical and vain attempt to keep alive his England career. It was all chronicled in the 2009 book, “The Beckham Experiment”–which appears to have been premature by at least three years. Much has been made in the media of Beckham’s 5 1/2-year stay since he announced his MLS retirement a couple of weeks ago. In 2006 BC (Before Beckham), MLS had 12 clubs, the latest of which, Toronto FC, paid $10 million for the right to lose money. Average attendance was a stagnant 15,504 (2.97 million total) and only four of the league’s stadiums were designed for soccer. This year, Montreal, having paid $40 million, became the league’s 19th club. The San Jose Earthquakes broke ground on MLS’s 15th soccer-specific stadium. Average attendance was 18,807 (6.07 million total)–better than the NBA and NHL for the third straight year. Each team has a youth academy, up from zero in ’06, and thanks to the so-called “Beckham Rule,” there are 31 star players scattered throughout a previously faceless MLS whose pay, in effect, doesn’t count against a team’s miserly-but-sensible salary cap. So how much credit does Beckham deserve? The truth, of course, lies somewhere in between. Clearly, there’s no one like him–think a superstar like Thierry Henry, playing in the nation’s biggest market, could have had the same impact on his own? What Beckham did–thanks to his splash, flash and the Beckham Rule that was necessary to make his arrival possible–was to show fans, the media, potential investors and corporate America that MLS was through treading water after 10 modestly successful seasons and finally meant business. Mere survival was no longer an option. Beckham will be missed. No sane person ever expected him to lift soccer in the U.S. to the same plane as gridiron football, baseball and basketball, and he didn’t. He merely moved the ball forward, his customary 35 yards at a time, and on so many fronts soccer now eclipses ice hockey as North America’s fourth-most popular team sport. What remains for the immediate future is what Beckham left on the field at the Home Depot Center: a cup final between two clubs owned by the same man, Philip Anschutz. As Becks departs, that sort of arrangement remains a necessity in an MLS still at the toddler stage. Comment: For Nike, which has been getting it wrong for so long, perhaps the tinkering can end for the next 10 or 15 years. 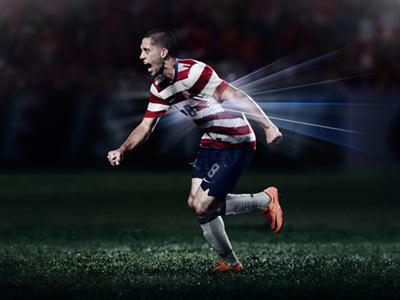 he U.S. jersey has always cried out for horizontal red and white stripes. Given the most prominent feature of our flag, what could be more distinctively American? The closest the team has ever come to that, however, was at the 1994 World Cup, when adidas, the supplier at the time, gave the team vertical red and white stripes. (The shorts, in a weird nod to Levi Strauss, were denim blue.) Worse, the jersey stripes were wavy, as if adidas didn’t want the U.S. National Team to be confused with Chivas Guadalajara or the Paraguayan National Team. (Paraguay failed to qualify for the ’94 World Cup, and neither, for obvious reasons, did Chivas). 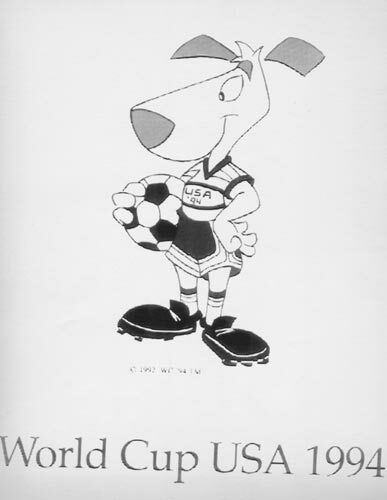 American soccer apparently has had an aversion to horizontal red and white stripes–call them hoops– since January 1992 with the introduction of the World Cup USA ’94 mascot, a Warner Brothers’ creation called Striker, the World Cup Pup. Striker was probably the most easily forgotten feature of the World Cup once the tournament began, but at the time, his first appearance was attacked, chiefly by Soccer America columnist Paul Gardner, because of the horizontal stripes on his jersey. Typically American, wrote Gardner: Given a World Cup, their mascot trots out wearing a rugby jersey. Some, but not many, pointed out that such storied sides as Glasgow Celtic and Queens Park Rangers–Brits like Gardner–have proudly worn horizontal stripes for decades. Didn’t matter at the time. 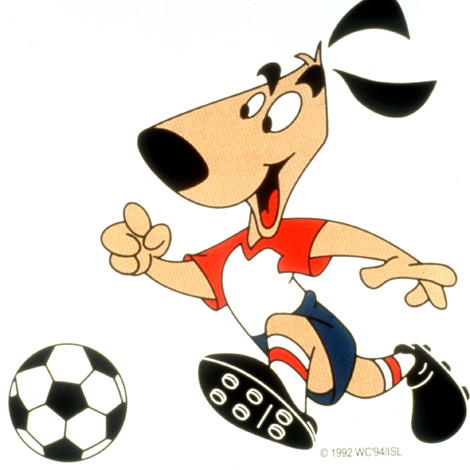 The first-time hosts were desperate to be politically soccer correct, and so Striker’s design was quickly altered, giving him red sleeves and a white trunk–no stripes at all. A silly over-reaction. Nearly two decades later, it is hoped that the U.S. can take the field May 26 in red and white hoops and no one will mistake them for ruggers. Given time, and a few victories, they’ll be unmistakably Americans.